(E) Kevin Durand, Mary Leigh From his first comic-book appearance in 1939 through his many incarnations on the big screen, the archetypal superhero known as The Batman has never been far from the American consciousness. Beyond shaping the way we read comics and graphic novels, Batman has also captured the scholarly imagination, telling us much about our society and ourselves. 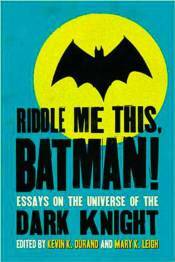 These essays examine Batman through a wide range of disciplines - philosophy, literature, psychology, pop culture, and more.